Pure joy of Listening! 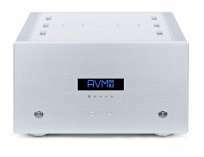 For more than 20 years people at AVM are developing and manufacturing electronic equipment for highest-quality music reproduction. We believe that any kind of music - regardless if classical, jazz or pop music - has been composed to bring joy and emotions to the listener. Technical equipment such as amplifiers and loudspeakers must try to transport these joy and emotions into the living room. - That means simply reproduce the information stored on tape, disc, hard disc or broadcasted by radio stations. This is in fact not as simple as it sounds. We are aware that every electronic and mechanical equipment leaves it's individual "fingerprint" on the reproduced music signal. When engineering hi-fi components we try to keep these "fingerprints" as inaudible as possible - and the inevitable rest as musical as possible. Before starting the design of electronic circuits or constructing mechanical parts we always question: What is the work to be done by this certain component and how can we consequently realize this in an optimal way. We strongly believe that the method of try and error seldom leads to good sounding hi-fi equipment. Therefore we do not develop unnecessarily complicated circuits which need a lot of compensating components in order to function correctly.